These are an expert-level road shoe at a sport price. They are made from stretch resistant synthetic fabric which ensures a breathable and durable shoe with and excellent fit and combine a buckle closure, which provides a snug fit and the ability for subtle adjustment, with two offset hook and loop straps which give added comfort and support without pressure points. They have air holes in the sole to increase ventilation and reflective detailing on the heel which helps keep you more visible in low light conditions. 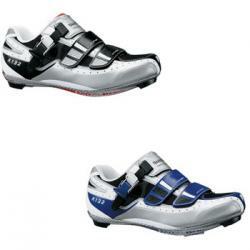 They are also compatible with SPD-SL and Look* cleats.